State Congressional District 48 candidate Hans Keirstead speaks at an Indivisible OC 48 last week. With the national reckoning over sexual harassment as the backdrop, six candidates who want to represent Orange County’s coastal cities, including Newport Beach, in Congress took to a stage in Costa Mesa last week to stake their claim as champions of women’s rights. The half-dozen Democrats and political newcomers participating in the women’s issues debate represent just a partial field of candidates jousting to unseat Republican incumbent Dana Rohrabacher. While Rohrabacher was re-elected in 2016, District 48 voted across party lines in the national race and endorsed Hillary Clinton for president. That cross-current of political sentiment reflected in the debate’s presenters and the candidates they invited to speak. The organizers spring from newly energized grass-roots activism, the year-old groups Indivisible OC 48 and Women for American Values and Ethics, which partnered with Planned Parenthood. To discern the depth of a candidate’s support with likely voters, OC 48 developed its own voter score card: 45 percent based on individual in-district donations, 25 percent on the dollar amount of in-district donations, and 30 percent on total cash on hand. While four men, Hans Keirstead, Michael Kotick, Harley Rouda and Omar Siddiqui, made the score-card cut, two women candidates, Laura Oatman and Rachel Payne, were also included. And the unexpected results released this week shows divided sentiment among Democrats who attended. Rouda and Payne by far outranked other candidates on women’s issues and their breadth of knowledge, based on the non-scientific straw poll among 238 people who voted after the debate. “Things are not as settled as they’d like you to believe,” Aaron McCall, chair of Indivisible OC 48, said of the candidates striving for front-runner status before the June primary. The most visible battle is between Keirstead and Rouda, both Laguna Beach residents, but Payne’s showing adds a wild card factor to the race. Earlier in the month, another straw poll put Keirstead on top. That vote, among leaders of the state Democratic Party, fell short of the 70 percent required under party rules for Keirstead to win a statewide endorsement outright. Rouda placed second. Keirstead, a cancer and spinal cord injury researcher, isn’t shy about his alliances with party insiders, which he said he cultivated while advocating for science issues on Capital Hill and at the National Institutes of Health. He counts among his supporters Ben Ray Luján, chairman of the Democratic Congressional Campaign Committee, which recruited him to run. The DCCC aims to take back seven California congressional seats in the midterm election in November. 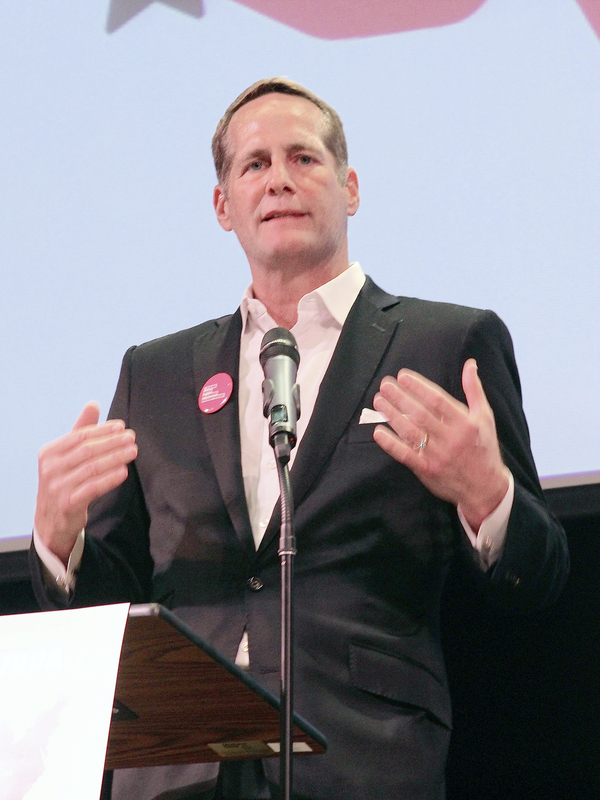 Harley Rouda scored high on his knowledge of women’s issues, according to a straw poll of 238 people after the debate. Keirstead, the chief executive of an Irvine biomedical company, conceded to a misstep that his foremost opponent is trying to exploit in new ads. Keirstead said he was at “fault for not stating the obvious” during an earlier debate in Seal Beach where he conveyed a conversation with House Minority Whip Steny H. Hoyer, ostensibly promising him appointments on influential House committees. In a recent interview with the Indy, Keirstead corrected the misstatement and said he omitted the caveats “if elected” and “if seniority permitted,” would he pursue those appointments. “I’m not so foolish to think they would appoint” prior to an election, he said. Rouda, a real estate entrepreneur formerly from Ohio, is the race’s leader in another way. He has the most cash on hand, even exceeding the incumbent. Campaign finance reports show that lead relies heavily on self-financing by Rouda himself. 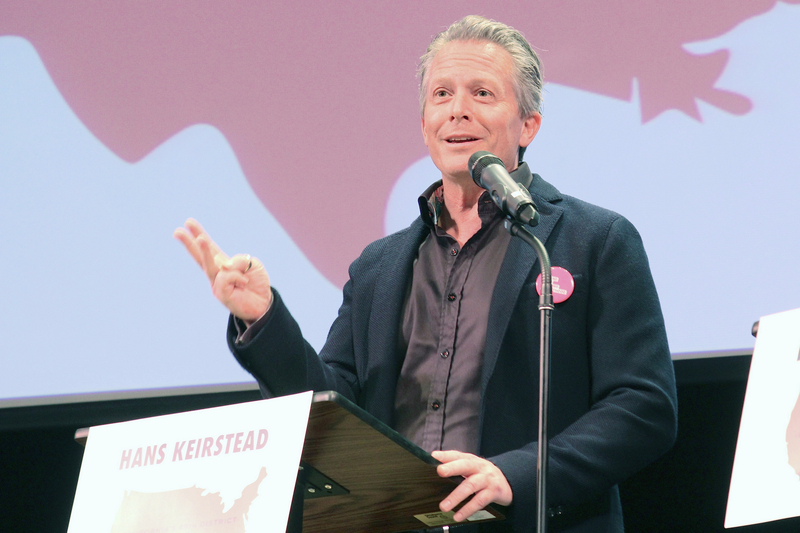 Oatman, a Newport Beach architect, emphasized jobs and solutions to address infrastructure threatened by climate change during the meeting attended by more than 800 people at Orange Coast College, with another 118 who watched a live stream. Payne, of Aliso Viejo, one of the lesser-known District 48 candidates, last week proved a debate stand-out, delivering answers in an impassioned torrent. Payne, a technology executive and entrepreneur, listed economic growth, equal pay and health care as her top priorities. She called for ending forced arbitration agreements and mandatory paid family leave. Some of Rouda’s answers revealed a bit of himself. For instance, he cited a family game, “I spy sexism,” calling out observations of inequity. But he also called for free, accessible birth control and opposition to efforts to defund Planned Parenthood. Kotick, also from Laguna and a business turn-around executive, called on women to eliminate “pink taxes,” such as a premium charged for feminine hygiene products, by starting more businesses. “We need to create a sense of urgency about pay equity,” he said. Keirstead said he would defend Medicaid, the government health care program for people with limited income. He is already drafting health-care bills he plans to introduce on his first day in office. They involve transparency in drug pricing and making medical records portable. Indivisible OC 48’s second debate will focus on immigration and foreign policy and is set for 7 p.m. March 6 at the UC Irvine Student Center, 4113 Pereira Dr. Another straw poll will be collected.